KUALA LUMPUR: In a rare move, Malaysian Airline System Bhd (MAS) is hiring part-time cabin crew, paying RM8 per hour to make up for the shortage of staff as the national carrier embarks on an expansion drive. Sources said the airline recently circulated internal memos to selected staff to inform them about the part-time employment exercise, which aims to add to its current strength of 3,800 flight attendants. This is believed to be the first time MAS has undertaken such a move. “Under the terms and conditions, the part-time crew must have experience and they will not be paid basic salaries but receive productivity allowance of RM30 per flight, on top of the RM8 per hour pay. “For last-minute calls less than four hours in advance, they will be paid RM70 plus the RM30 productivity allowance and the hourly wage; for above five hours it is RM50 on top of the productivity allowance and the hourly rate. There are no other privileges,” said a source. He added that as part-time staff, their employment contract will be reviewed after a year. While MAS already has 3,800 flight attendants, the airline needs more cabin crew after adding new routes and frequencies in recent months. It has reinstated flights axed two years ago. “Furthermore, the festive season is just round the corner. This is a quick way to build up the numbers,” the source said. Following MAS’ aggressive cuts in its flight routes and frequencies in the past, the “excess” cabin crew were seconded to other departments such as the Golden Lounge and curbed side attendance. It is learned that this group of cabin crews are now back on their flight duties. However, there lies a concern if MAS’ recent expansion bites back. After all, MAS’ expansion backfired in the past. Former CEO Tengku Datuk Azmil Zahruddin had admitted that the airline expanded and geared up too quickly during his tenure between 2009 and 2011. Current MAS managing director and CEO Ahmad Jauhari did not reply to questions from The Edge Financial Daily at press time. 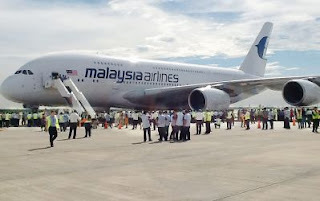 Analysts view MAS’ latest operating statistics positively, adding that these could well be reflected in its second quarter ended June 30, 2013 (2QFY13) results, scheduled for release on Wednesday. For 1QFY13 ended March 31, MAS’ net loss widened to RM278.6 million from RM171.3 million for 1QFY12. This was on the back of a 12.9% increase in revenue to RM3.5 billion from RM3.1 billion. However, net cash flow generated from operations was positive at RM147.28 million versus a deficit a year ago. MAS, which is deploying new planes to its fleet, recently strengthened its balance sheet with a rights issue that raised about RM3.2 billion. An analyst told The Edge Financial Daily that MAS is on the right track with its expansion plan. “I don’t think MAS’ expansion plan is ambitious. The airline is raising more money and needs to stay competitive which is why it is adding more routes,” she said. Maybank Research’s Mohshin Aziz said the expansion is not an issue. The issue lies in the selection of routes. He reasoned that reinstating the Dubai-route is risky as it will be difficult for the airline to compete with Middle Eastern carriers such as Emirates. Nevertheless, Mohshin said it is a wise move to increase frequencies to Kochi in India and Auckland in New Zealand. He said it’s a better calculated risk and the variables seem more promising. According to Mohshin, in the past MAS had irregular schedules and transits which made the flights “handicapped”. The wrong strategy caused the airline to not succeed as well as it should have. Jauhari was quoted earlier this month as saying the group was monitoring every market and every opportunity available. “For Dubai, we see as an increasing market but more importantly, it allows connectivity between the Middle East which is a fast growing market, and Malaysia, which is a very popular Muslim destination for travellers from the Middle East,” he said. MAS will be commencing flights to Dubai next month and Darwin in Australia by November. It will also begin flights to new destinations such as Kochi in September and has added frequencies to some existing routes, including Auckland. The airline said these destinations have very strong secondary markets and are destinations that fit into its overall network. Furthermore, MAS said it is looking at every opportunity to deploy its capacity to profitable routes and is considering more frequencies on its domestic market but did not reveal further details.